Does Nuking a Potato Kill Enzymes or Nutrients? You really want a baked potato, but perhaps you do not have a conventional oven or the hour and a half that it will take to bake a potato in your oven. Popping a potato in the microwave saves time and effort, but there are trade-offs for doing so. A potato is a potato, right? Not necessarily. How you cook one can affect the nutrients you get. A baked potato offers 45 percent of your vitamin C for the day. It is also a good source of iron. With 620 mg of potassium, it is rich in this mineral, too. It also is low in those things you try to avoid like fat and sodium. Of course, if you add sour cream and butter, you will get fat and more calories. The skin of the potato is made up of healthy fiber. Some people worry that if you peel a potato and boil it, many nutrients are lost. 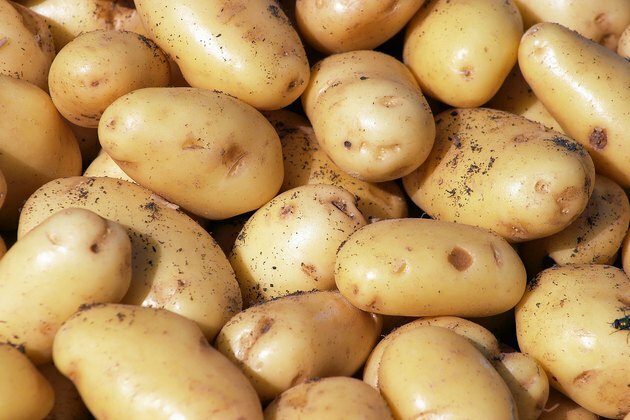 According to the Washington State Potato Commission, most of a potato’s nutrients are inside it and not on the outside. Although removing the skin will remove fiber, the nutrients will stay. A microwave is a source of non-ionizing radiation. It is not the same kind of radiation as produced by an X-ray machine. According to the United States Department of Labor, non-ionizing radiation can be a risk to humans, especially in high doses. Controversy exists around how much is too much and what a microwave does to the food put inside it. Food that has been cooked in a microwave, or “nuked,” is not radioactive according to the American Cancer Society. Nuking a potato does not change its chemical structure; it simply heats up water molecules differently. However, potatoes do contain an enzyme, catalase, that is sensitive to and affected by heat. This enzyme is affected all methods of cooking, including the use of microwave ovens. You can be assured that microwaving a potato affects its nutrients no worse than dicing it up and cooking it in a pan. If a Potato Has Roots, Should You Eat It?